Concrete steps form the stepping stones of walkways and entrances all around our homes, but time, weathering or unexpected pressure will damage these steps, causing all kinds of damage. When a step begins to separate from a walkway, it is often the result of high pressure or severe moisture changes. These areas can generally be fixed with a solid concrete patch and protective sealant that will help prevent separation in the future. Concrete steps will crack and gap over time. Brush out the damaged area with a wire brush to remove loose dirt and dust. Use a wet/dry vacuum or a can of condensed air to blow out dust particles. If necessary, chisel away loosened pieces of concrete with a chisel and hammer. The area must be completely clean before repairing. Paint a thin layer of concrete bonding adhesive over the entire area that requires repaired. The bonding adhesive will help the cement patch attach to the old surface, creating a firm new hold. Follow instructions on the adhesive, as most will need five to 10 minutes to cure before you can apply the patch. Mix quick-setting concrete with water per product instructions to create thick cement putty. When the adhesive and patch are ready, spread the concrete patch into the damaged area with a pointed trowel. Spread in thin layers, forcing the patch up against all old concrete surfaces. Continue to add patching material in thin layers until you fill up the entire damaged area. Use the smooth edge of the trowel along the edges to bring the patchwork flush with the rest of surface. Run a rubber float over the edges of the patch to feather out the edges and blend it with the rest of the concrete for a smooth look. Allow the patch to dry for 24 to 48 hours; if rain or dew will settle on the area, cover the patch with plastic wrap to protect it from moisture. If you have to use wrap, the patch will take longer to cure. Seal the patched area with concrete sealant, spread onto the surface with a sponge or paintbrush. The sealant will prevent moisture from leaking into the concrete, preventing future separation and cracks. 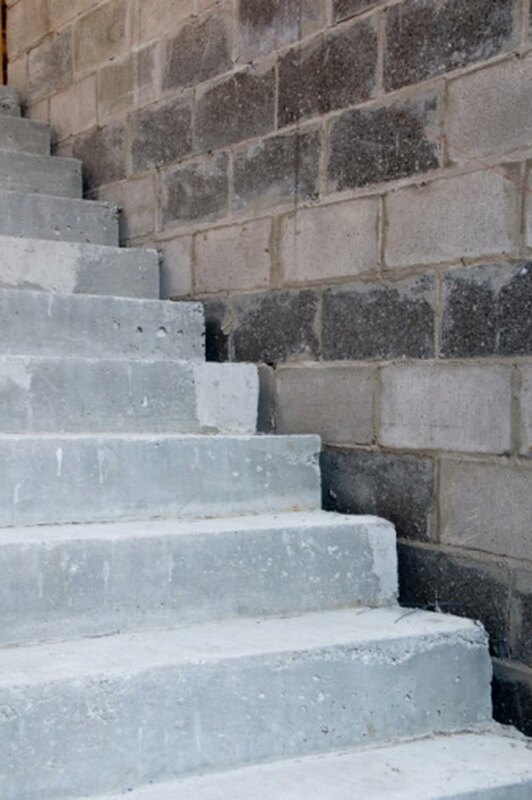 If your concrete steps were previously unsealed, seal them as well to prevent future damage.